In Australia, we recently filled out a Census, profiling who we are and what our lifestyles ‘look’ like. There was one particular question that I answered about the amount of unpaid work that I performed in the household per week. Initially, I was modest with my response until I sat back and actually added up how many hours of work that I performed per week. I was quite astounded by the final figure. Partners also answered the question and quite honestly, the inequity which still exists is phenomenal. I happen to have a husband who (after many years of ‘training’) contributes a lot to the housework yet the disparity still remains. On my days off, I used to clean the house like a woman possessed. I regularly took a picture and sent it to my husband via MMS. I'm still not sure what response I was after, but guess what? I didn't get it and I still had to go back and do it all again the next week. Why? Insanity. It lead me to think about the reasons why women spend a ridiculous amount of time doing housework and running around after their family and I came up with some points that specifically relate to me. I thought it would be of interest to include my thoughts in my series about organisation as crying ‘time poor’ is the reason why many women refuse to take up a hobby or neglect a much loved hobby that gives them a lot of pleasure. It seems to be the catch cry of our time ‘Oh, I’m just SO busy’. But are we really? These are MY thoughts . . . . perhaps you can relate to some of them? I’m having trouble moving on from the ‘needy’ stage. Everyone loves to be needed, but children (and men) do not stay babies forever. They have arms and legs, they can help. 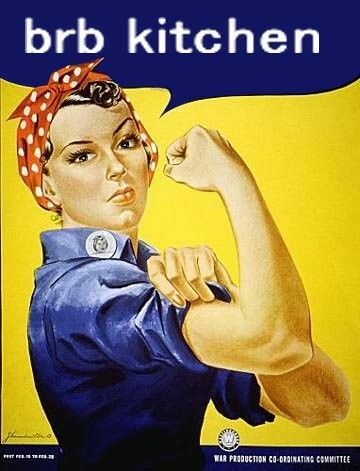 Even if it’s not perfect and hubby puts the toilet roll going under instead of over – it’s OK, isn’t it? We live around the corner from school – the kids can walk by themselves, they’ll be fine, won’t they? If they don’t get their project in on time, who is to blame? But will the teachers think poorly of me as a parent? Do I insist on doing it all to be a martyr so I will always have a bunch of people who make me feel needed? I am my own worst critic. Whose standard of perfectionism am I trying to measure up to? I’ve never reached that elusive ‘perfect’, so what am I looking for? Has anyone ever noticed whether I have dusted the skirting boards this week? Nobody is going to die if I let the dust bunnies play behind the couch for another day. Being ‘lazy’ is unacceptable. Isn’t that what we were always taught as children? So if I run around like a maniac, won’t people admire my work ethic? Doesn’t it feel good when people say ‘Wow, you’re amazing, I don’t know how you do it’? I can do it all and I will prove the doubters wrong. You know, perfect house, perfect family, perfect marriage, perfect career. Is my goal in life to play ‘Battle of the stubborns’? Why is it SO hard to accept an offer of help? These are things that are so deeply engrained in who I am that I often travel through each day being motivated by unconscious fear. I’m still not sure what I am afraid of, yet my behaviour of running around trying to be everything to everyone still continues. 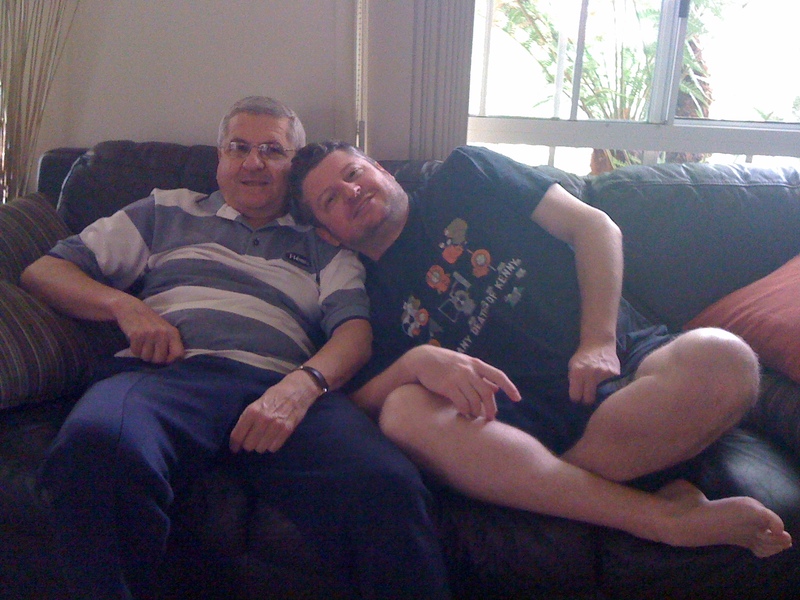 My DH and his Dad. The ability to relax on the couch is a genetic strong point in his family - I call it the Gennari gene. Are they thinking about folding washing or cleaning the pantry or stripping the sheets? Umm. no. I have made a small amount of progress towards freeing myself from this existence and my papercraft hobby has played a huge part in this process, but I had to find TIME to devote to it first. How did I do it? I bumped myself up the priority list. After all, happy mummies make happy families. I let myself fall to the bottom of the list. Nobody was going to stop and feel sorry for me and put me to the top of the list, so it was up to me to do it for myself. I let go of the ‘mummy guilt’. Who made up that absurd concept in the first place? (It was a female author) I am important, I matter. I learned the hard way. I fell to pieces (a few times) and finally realised that life is far too short to be in a constant state of depression and anxiety. I had to take action and make the decision to create my own reality. Sometimes I do really well, sometimes I don’t do so well – but I am aware and connected to my own feelings. I changed the way I lived my life because it wasn’t working. I quit my full time, stressful job. I didn’t quit my career, I made it work for me. 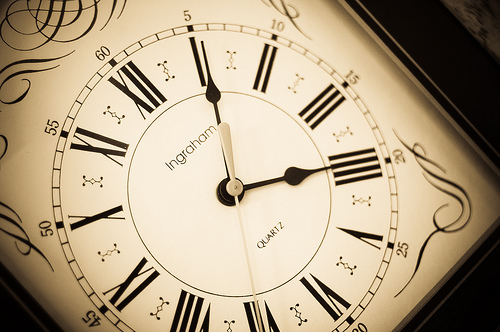 Not always possible for everyone – but don’t wait forever for it to work if it’s obviously not. I became a Stampin’ Up! demonstrator to supplement my casual income and this forced me to spend more time doing what I love. It might sound cliche, but it’s true. I lowered my standards and learned to not care so much. Strangely enough, no children or husband have been harmed in the process. Nobody dropped dead because their washing wasn’t lined up immaculately in their cupboard and toilet paper still works when it goes ‘under’ instead of ‘over’. And . . . they still love me just as much as before. I learned to accept help. This is a work in progress, I still haven’t perfected this one. If you have some spare dollars, hire an ironing lady, even if it’s only once or twice a year. If your mum/mother-in-law/neighbour offers to help – say YES. They offer help because they care about you, not because they think you’re not coping. 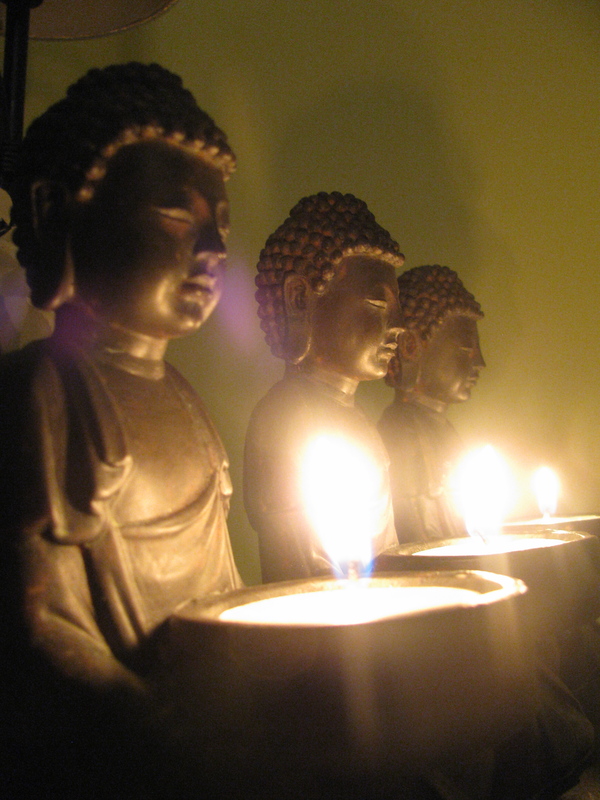 I rediscovered spirituality, particularly Buddhist teachings. It talks to me. It speaks volumes. I get emails from this site every day into my Inbox and I read them over breakfast. It centres me, it reminds me of what is important. Finally, I took some lessons from my husband. I practised being a ‘bloke’. I pretended I couldn’t see mess, I sat and focused single minded on my hobby and I allowed ‘whatever’ to enter my vocabulary. It’s very liberating. The washing didn’t run away. A few times, it even found it’s way to the cupboard without me. Yes, the housework is still here. Yes, life sometimes gets overwhelming. Yes, I still find myself in a filthy mood from time to time. The goal is balance. 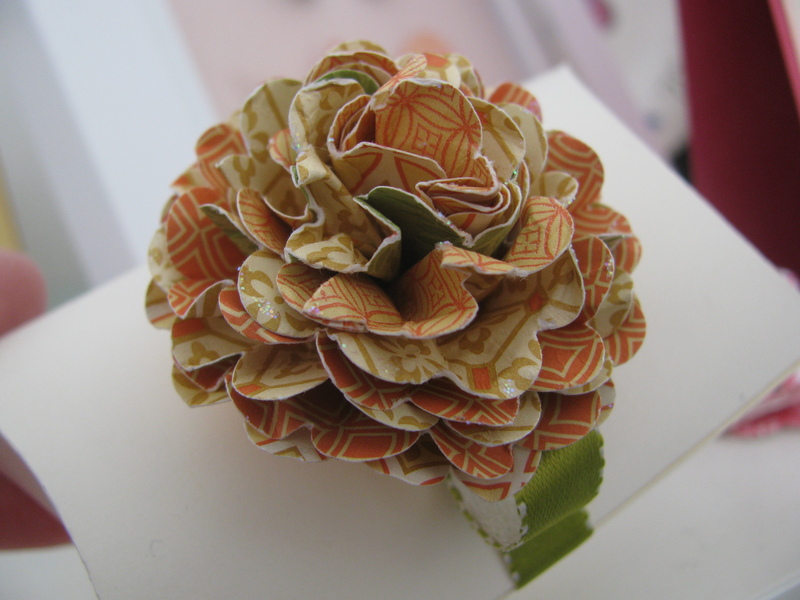 Papercrafting is part of my balance and if things aren’t working for me, they don’t work for my family. Having a hobby is an essential part of a healthy life balance. Remember, nobody is glad on their death bed that they worked more and played less! I had to have a giggle at myself whilst I was putting this post together – I have been thinking about how often I like to get in and reorganise my stash and how many different ‘systems’ I have had in place over the years. I feel very settled with my current set-up, I think it has a lot to do with the fact that we now own our own home instead of renting and being on the move every few years. Teamed with the fact that I have the most gorgeous Celery Green walls in my creative space, I think it’s getting closer to perfection! Stampin’ Up! 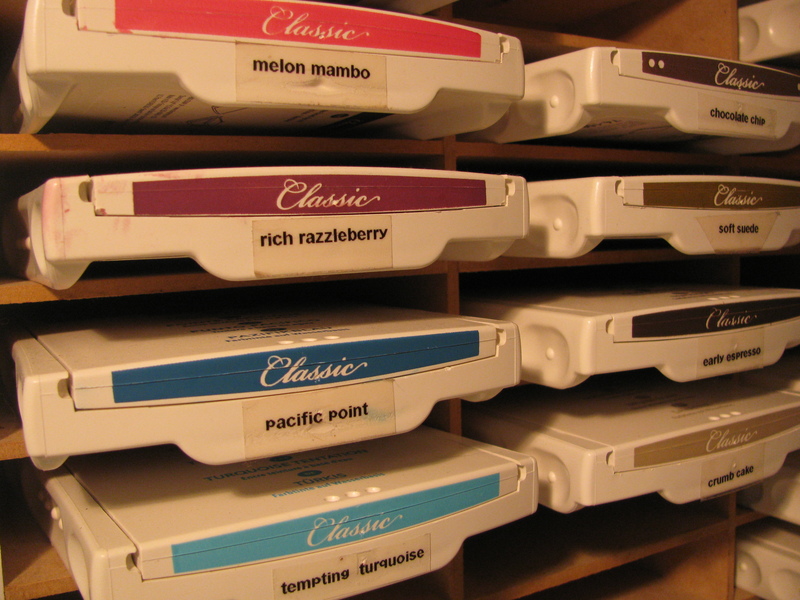 stamps are incredibly easy to store considering that they come in their very own storage cases. 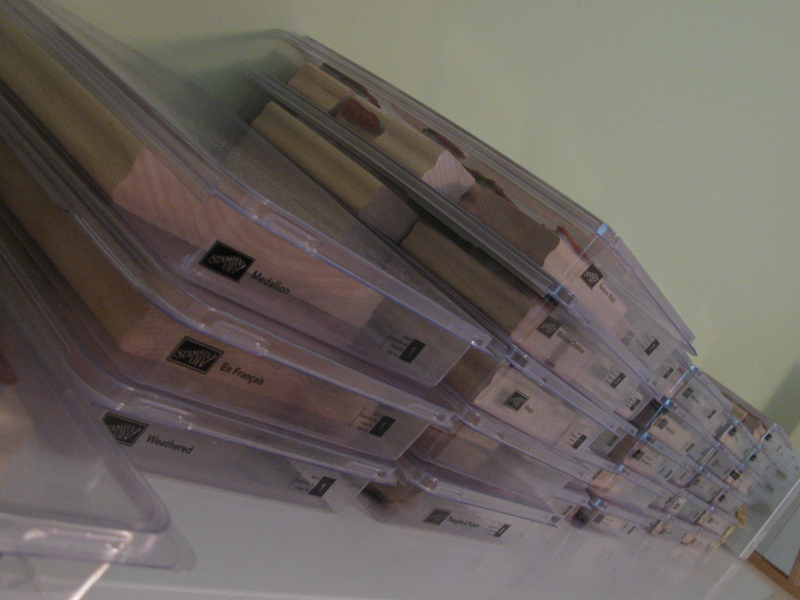 I still prefer the wood mount stamps and they are stored nicely above my desk atop an IKEA wall shelf. This makes them really easy to see and to reach whilst I am seated. IKEA and Stampin’ Up! were made for each other, seriously. As you can see in the very first image of this post, my Clear Mount sets are arranged like lovely little books, perched between some birdy bookends. The DVD cases that these sets come in are VERY easy to store and take up such a small amount of space! The thing I love the most about these cases is that the images in each set are displayed along the spine of the case. Beautiful. 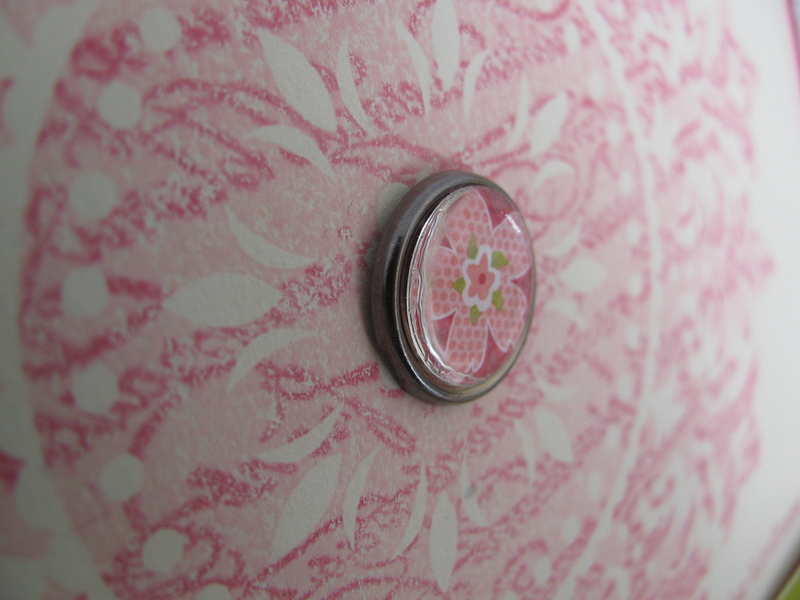 Keep reading to see how I store my Stampin’ Around wheels . . . . . 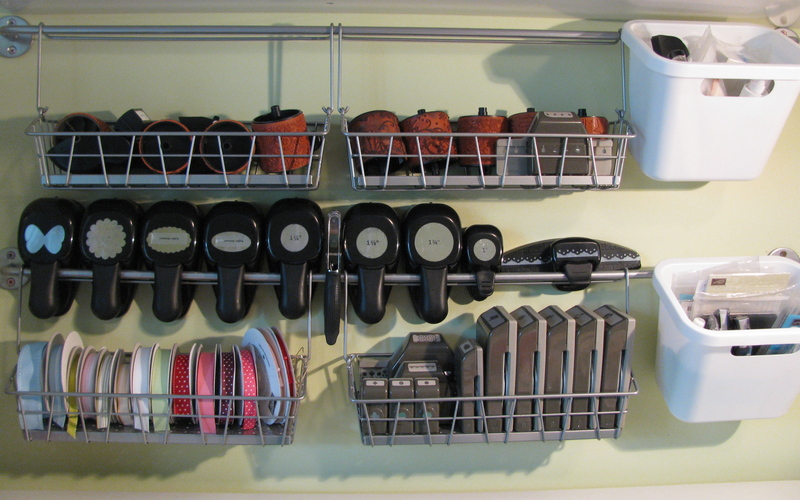 I saw a similar idea for storing punches and ribbon some time ago, probably during one of my mad reorganisations. These are rails and baskets from IKEA. The rails and baskets only cost $3.99 each. The little white buckets on the right didn’t cost much more! AmAzInG! The baskets are the perfect size for SU! regular rolls of ribbon. The older style punches perch perfectly on the rail and the newer style punches fit into the baskets as if they were always meant to be together. 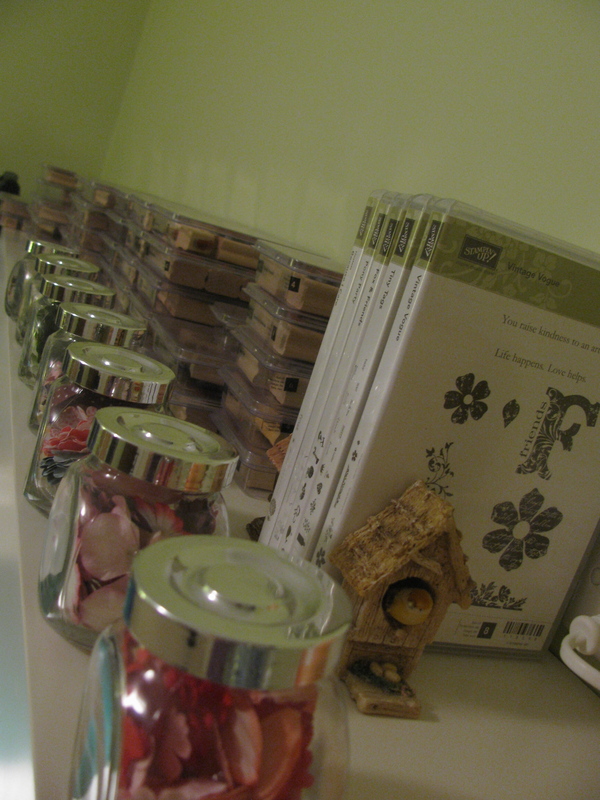 The little white buckets store all my Stampin’ Up! 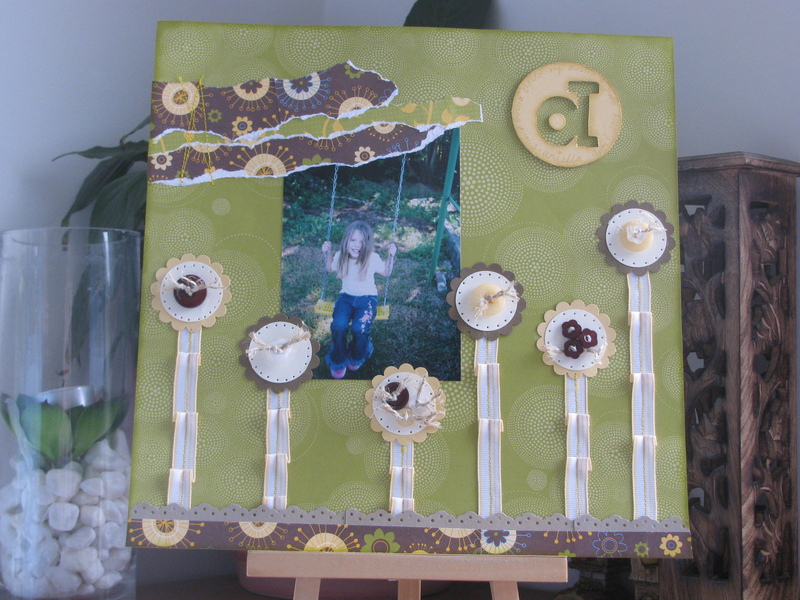 accessories such as snail adhesive, blender pens, sticky strip, two way glue pen, embossing buddy, glue dots, sanding blocks, Stamp-a-ma-jig, stampin’ dimensionals, stampin’ mist and basic pearl jewels. It is unbelievable how much you can fit into them and still be able to access everything easily! My Stampin’ Around wheels and Stampin’ Around handles live in the top baskets where I can see which wheels I have and access them very easily. Stampin’ Up! 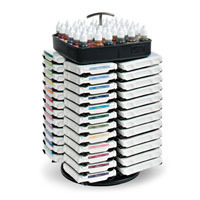 carry a great Classic Stampin’ Pad caddy (available on page 163 of the IB&C) which holds 48 Classic ink pads and 48 ink refils! Although I really love this little caddy and it’s great design, I decided to go for another version of an ink pad holder, one which would fit better with my white desk. My Classic Stampin’ pad collection is organised in the same order as my cardstock and seeing them like this allows me to decide which colour pad I NEED next. 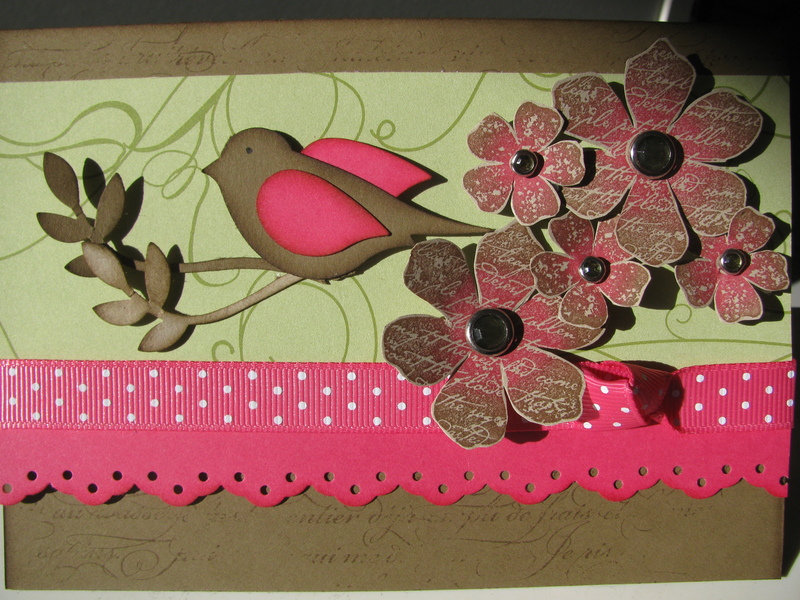 As you can see, my Stampin’ Spots sit on top. I simply don’t use some colours enough to warrant buying a full size pad, so I simply use the Stampin’ Spots when required! As expected, I have them all labelled neatly using my trusty Dymo! So quick and easy to find the exact colour you need and to pack them away where they belong when you are all done! What a wet and stormy day it is here on the coast today! 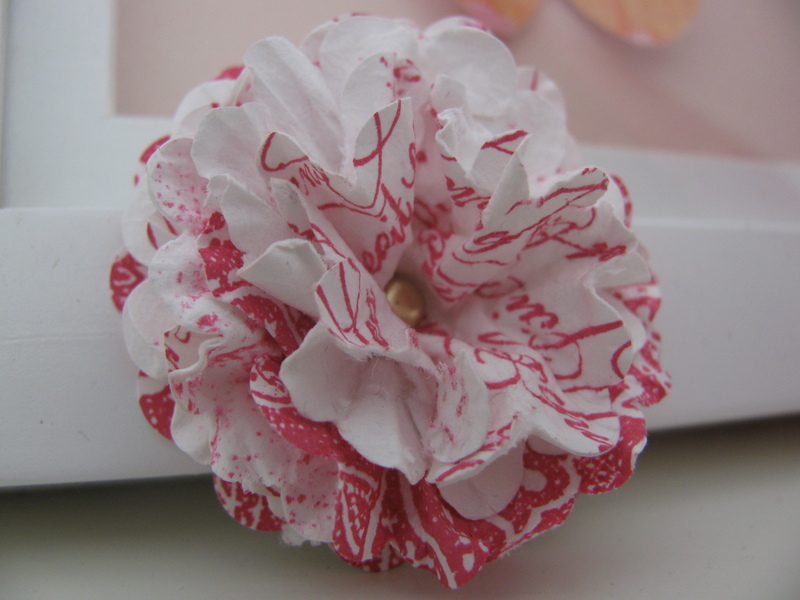 Perfect weather for crafting and for blogging! 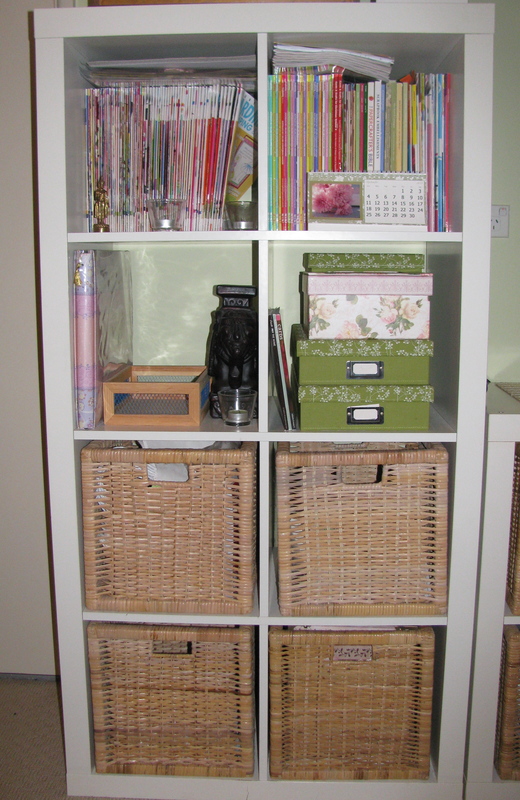 I have decided to run a series of posts on my favourite topic – ORGANISATION! Anyway, I spent yesterday afternoon doing something I call ‘Reorganising my organisation’. 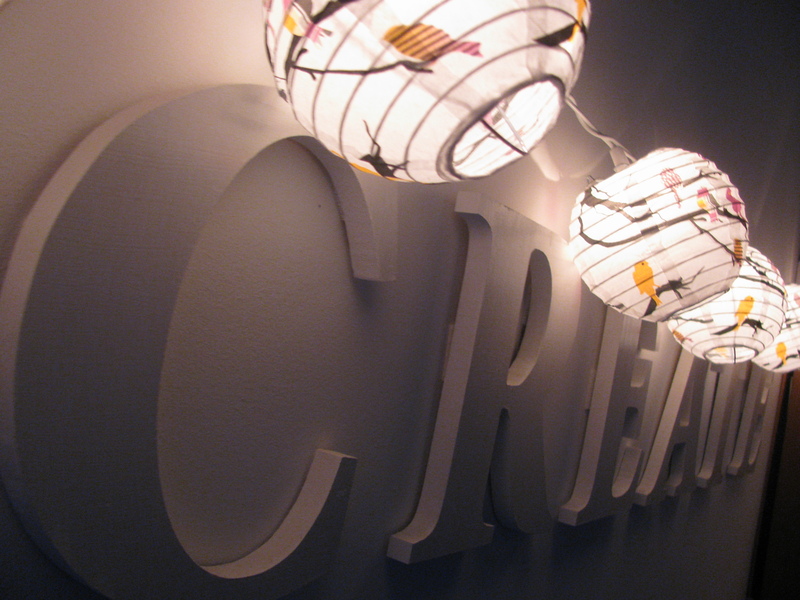 I often do this when I’m on holidays and the room that gets reorganised the most is my creative space, of course! I thought I would share some of the organisation systems that I use, as they have evolved over time and I certainly have trialled quite a few. Some work beautifully for me and others fail dismally. The aim of any system is to ensure that all my products get stored safely and used regularly. Efficiency – YES! 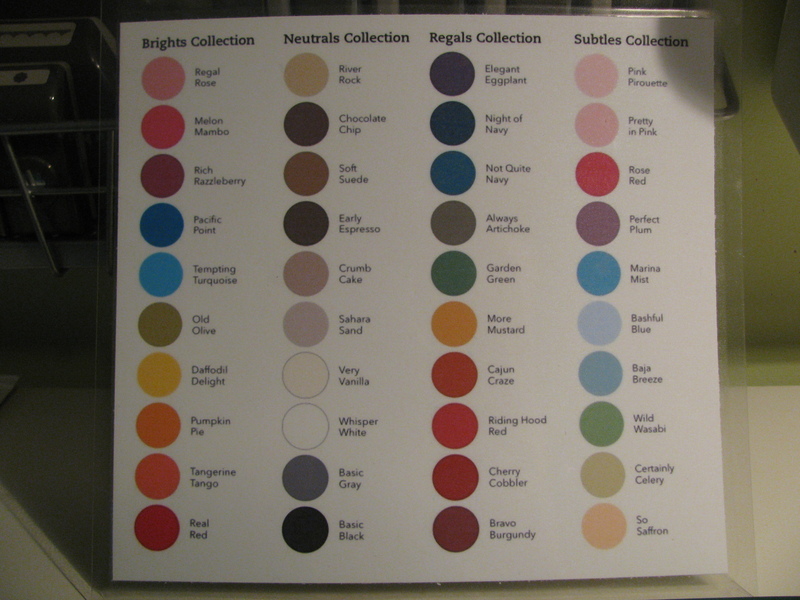 I organise all my colours according to this chart, which came out as part of The Colour Renovation. Unfortunately, the colour order does not correspond to how they are organised in the Ideas Books and Catalogue! 😦 I just had to build a bridge over that one! 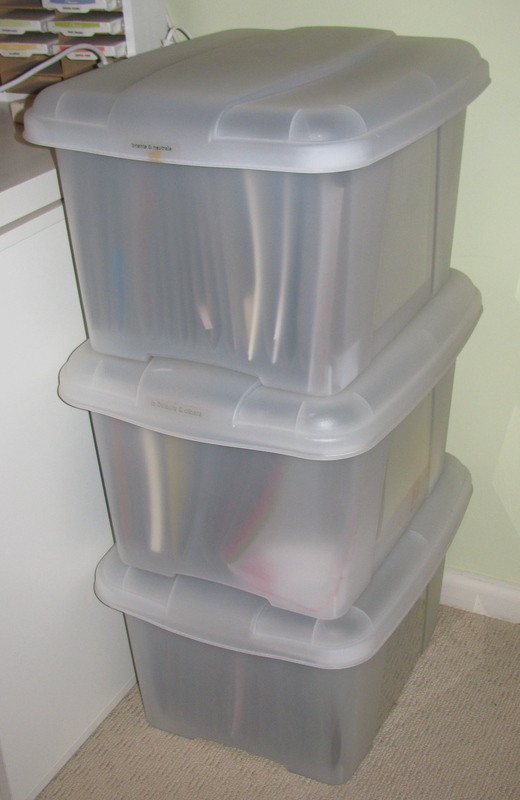 My A4 cardstock lives in portable stackable filing boxes, which I purchased from Officeworks (they are approx. $20 each). 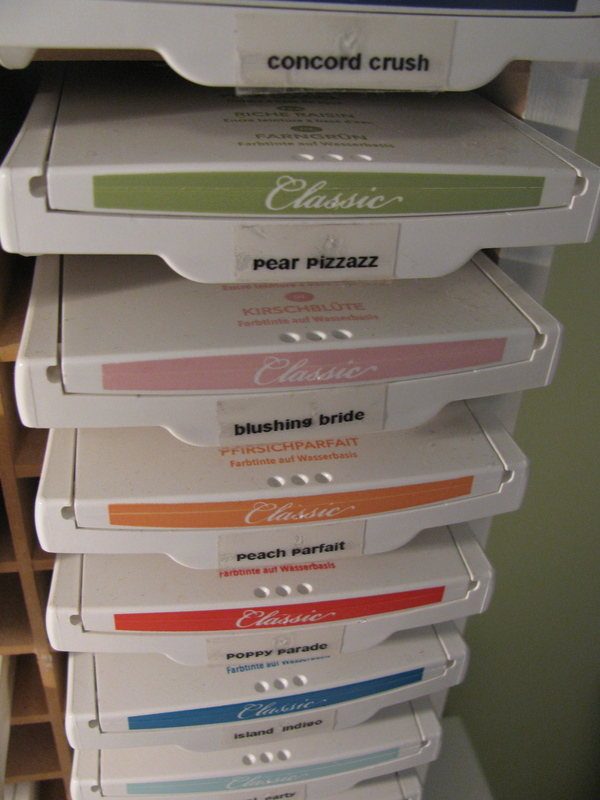 I store two colour collections per box, which are labelled on the lid for ease of finding. Gotta love my Dymo labeller! 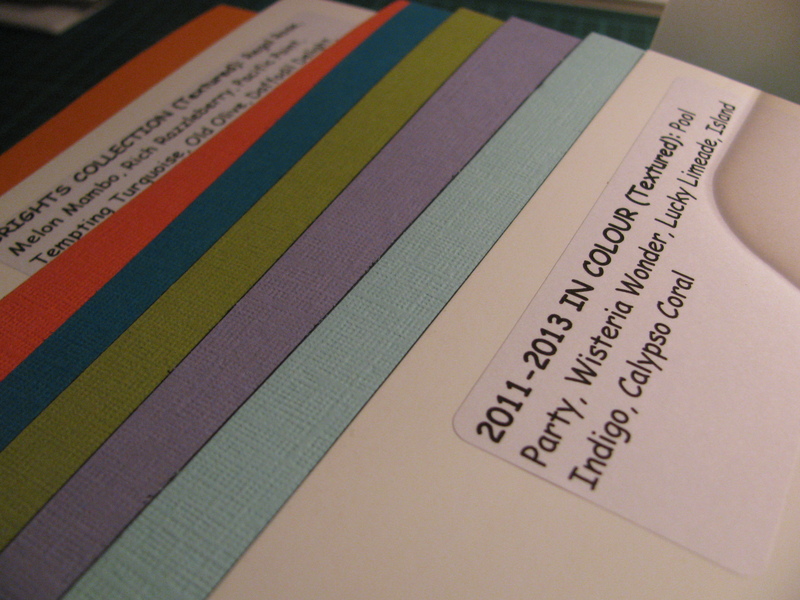 Inside the boxes are hanging files, labelled with the cardstock colour names. When I am crafting, I position the boxes open across the floor, which makes it super easy to spin around and grab what I want. 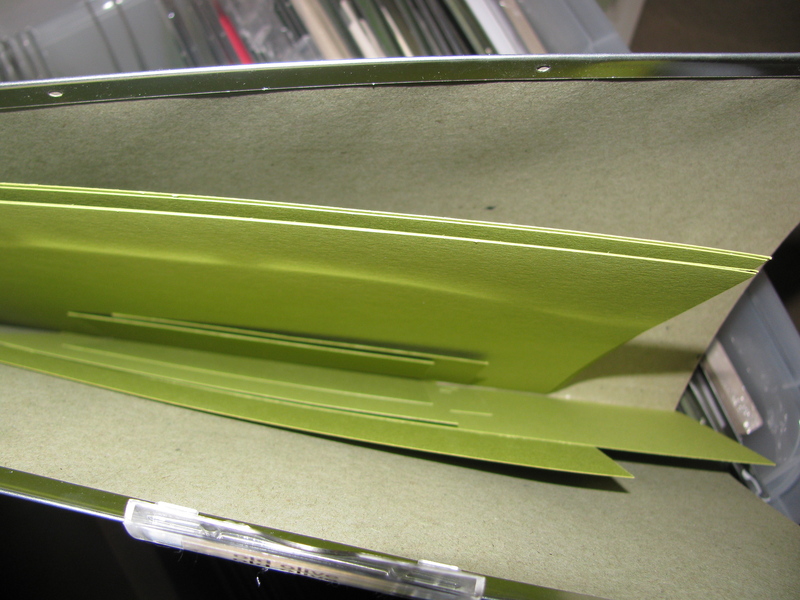 The hanging files are organised with full sheets of cardstock to the back and smaller offcuts at the front (to ensure they get used up first). 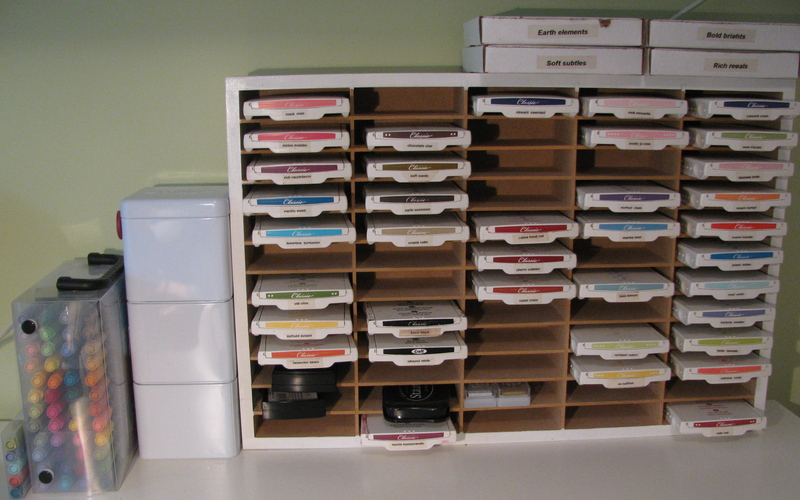 My collection of 12 x 12 cardstock is a growing part of my collection, so my storage option is one that will probably evolve! I have my 12 x 12 cardstock stored in a 12 x 12 tote box. Instead of buying expensive paper dividers, I have used the 12 x 12 cardboard sheets that come at the back of the Designer Series Paper. These dividers have a label on them with the Colour Collection, the type of cardstock (smooth or textured) and the colours, in order of course! 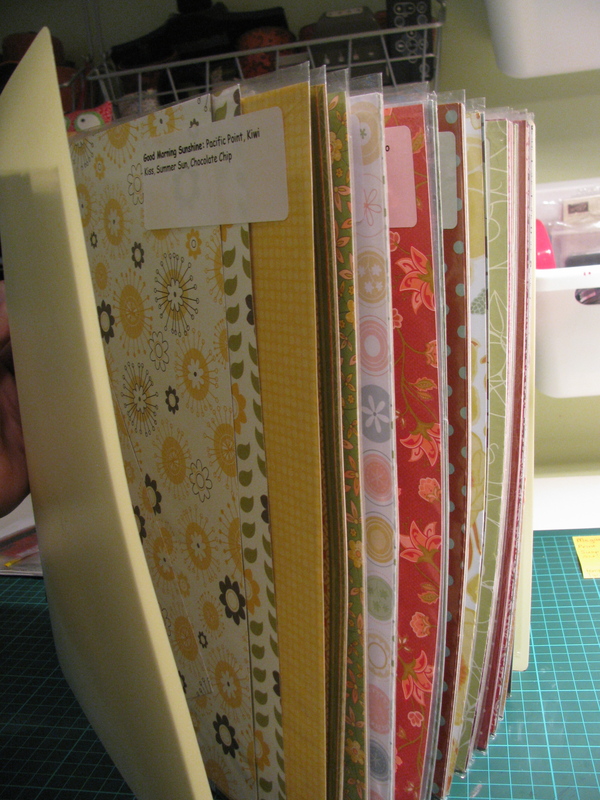 I purchased some 12 x 12 display folders many, many years ago to store my unfinished scrapbooking layouts. This was before I had my own creative space and my stuff got spread out all over the dining room table! These days I have a desk with space to leave unfinished layouts until I get to work on them again. 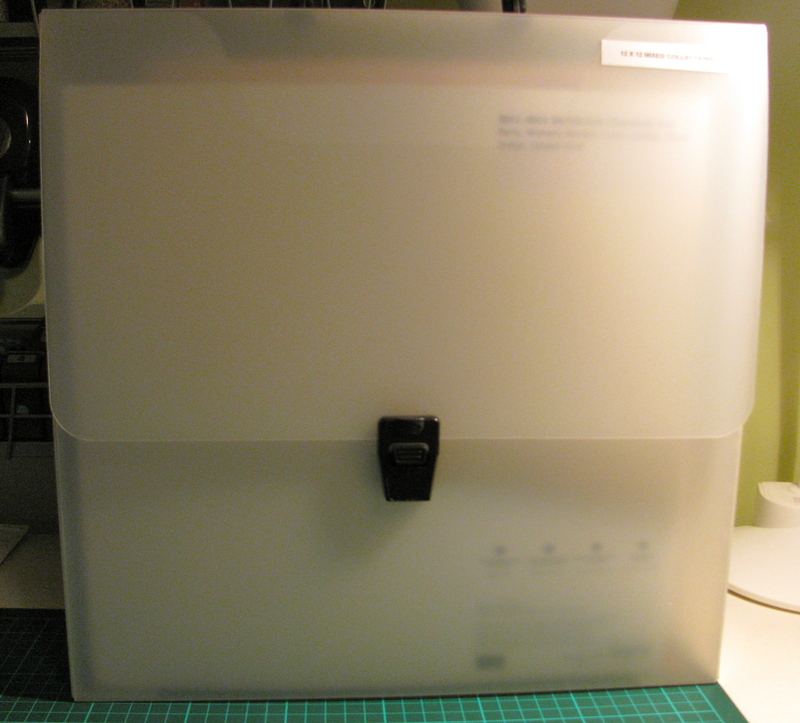 I am now using these display folders to store my Designer Series Paper. Each pocket has one design, with a label on the front with the design name and most importantly, the cardstock colours which coordinate with the DSP. As with my cardstock, full sheets are stored at the back, with offcuts to the front. 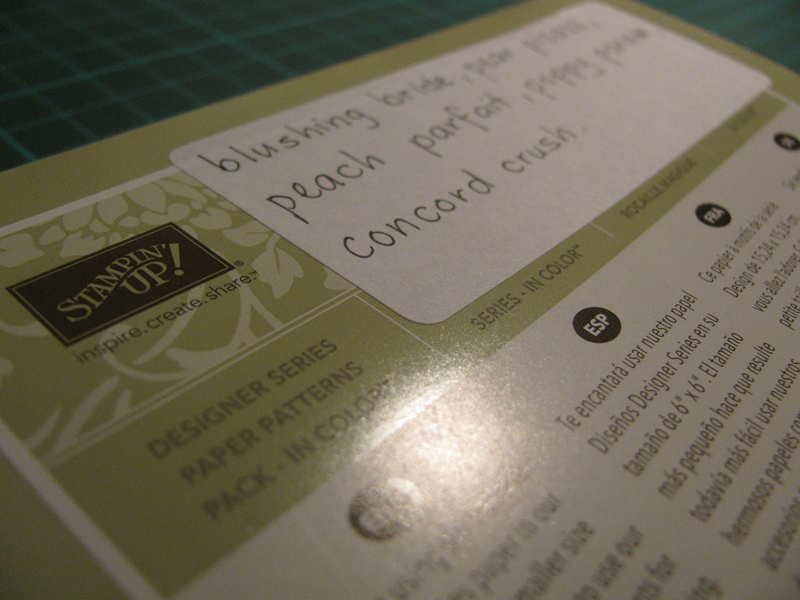 Smaller stacks of Designer Series Paper have a label attached to the front with the coordinating cardstock colours. I find this saves a lot of time trying to remember what is what and which is which! 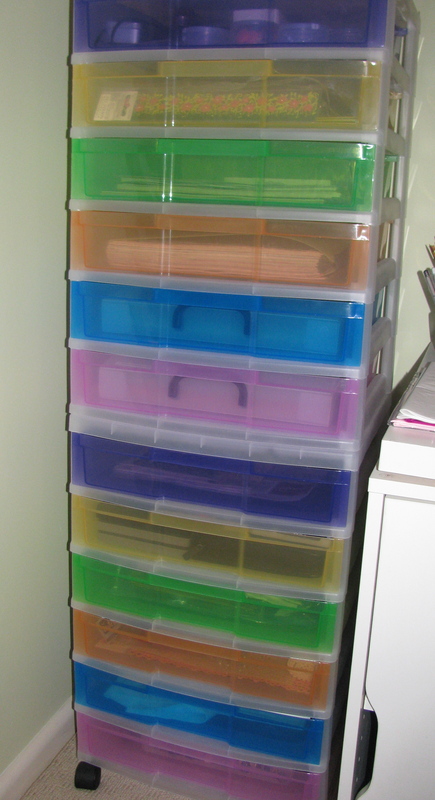 The 12 x 12 tote boxes and display folders all live happily in my 12 x 12 colourful drawers, which were purchased from Kmart (approx $49 each, two sets stacked shown here). They are on wheels, which means they are portable and easy to move and clean behind! All my papercraft mags, catalogues, envelopes and other papery what nots get stored in various corners of my trusty Expedit shelving! Hooray for IKEA! I guess the most important thing about organisation is to find what works for YOU! Expect your organisation system to evolve as your own needs evolve and as your collection of papercrafting items grows! (they are know for breeding unexpectedly!). 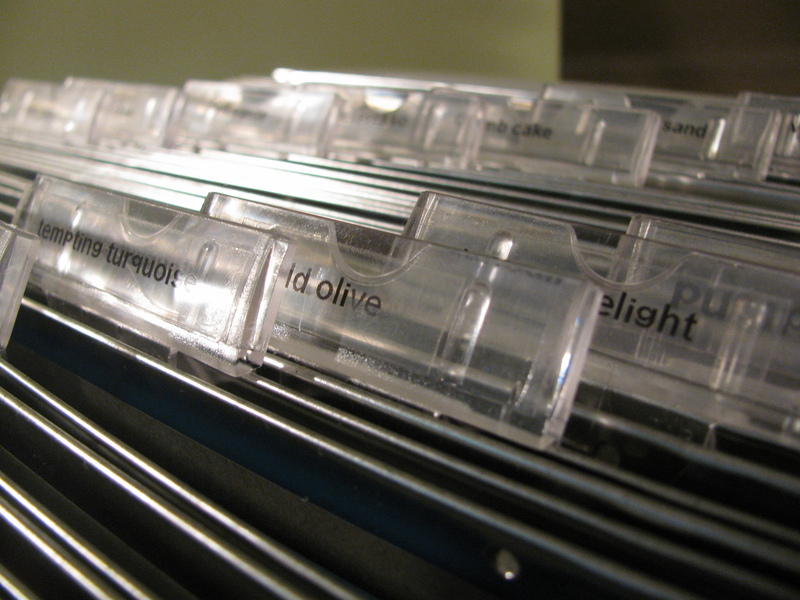 Stay tuned for the next installment . . . . . . Storing stamps and punches. If you are in Sydney today, you will be able to see how dreary and cold it is – brrrrr! 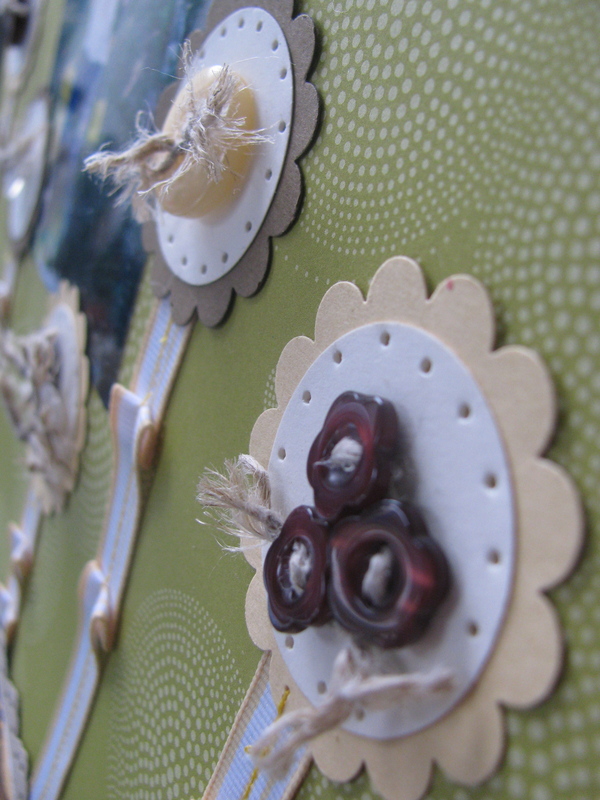 Instead of retreating into hibernation, I could see a perfect opportunity for a day of scrapbooking. 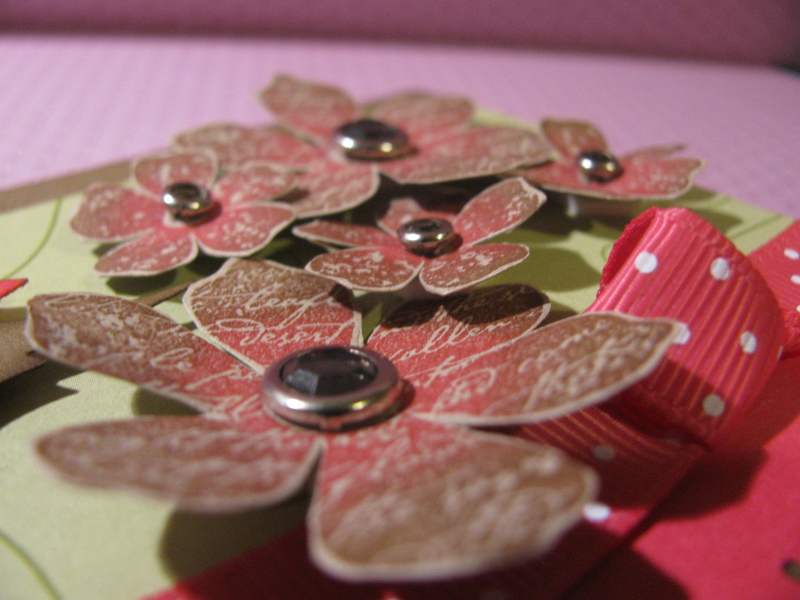 Don’t forget that this month’s class is Scrapbooking – don’t forget to drop me a line and book your spot! Use a technique that I have never used before – in this case, it was sewing. 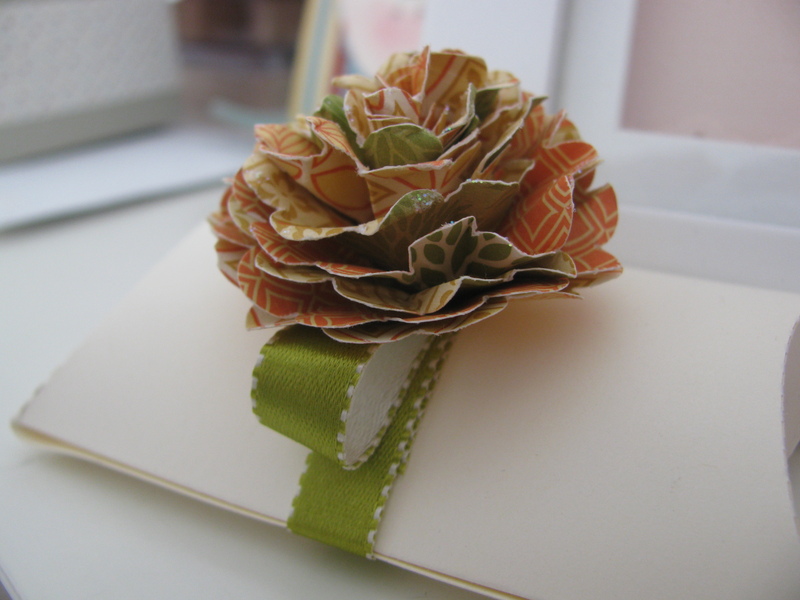 Use up scraps of Designer Series Paper and cardstock that I have lying around. Stamp set: There wasn’t one! GASP! Other: Snail adhesive, Eyelet border punch, So Saffron striped grosgrain ribbon, Latte buttons, Hemp twine, sewing machine and yellow thread (YAY! 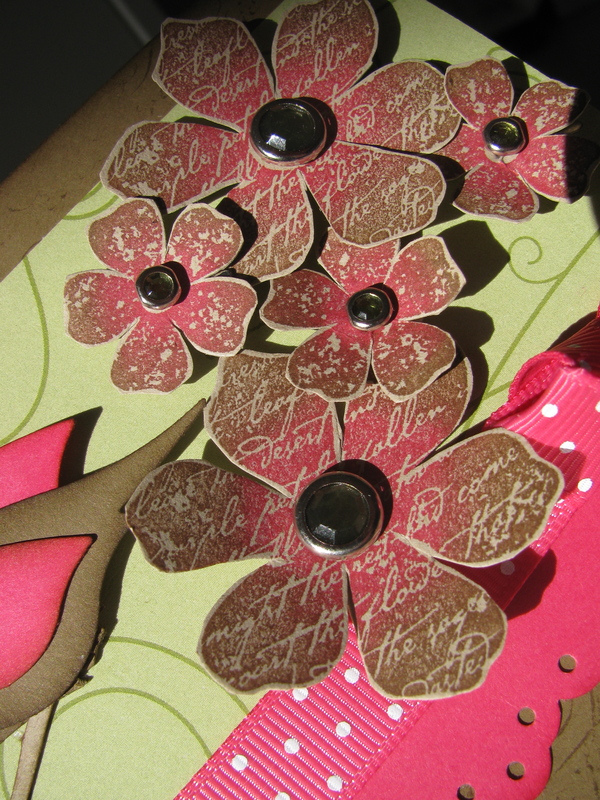 ), paper piercer, scallop circle punch, 1 3/8 ” circle punch, So Saffron Stampin’ Write marker. Did I ever tell you how much I dislike winter? I must admit, I am getting better at not being too ‘bear’ like during the colder months, and having an indoor hobby which I love does help JUST a little! 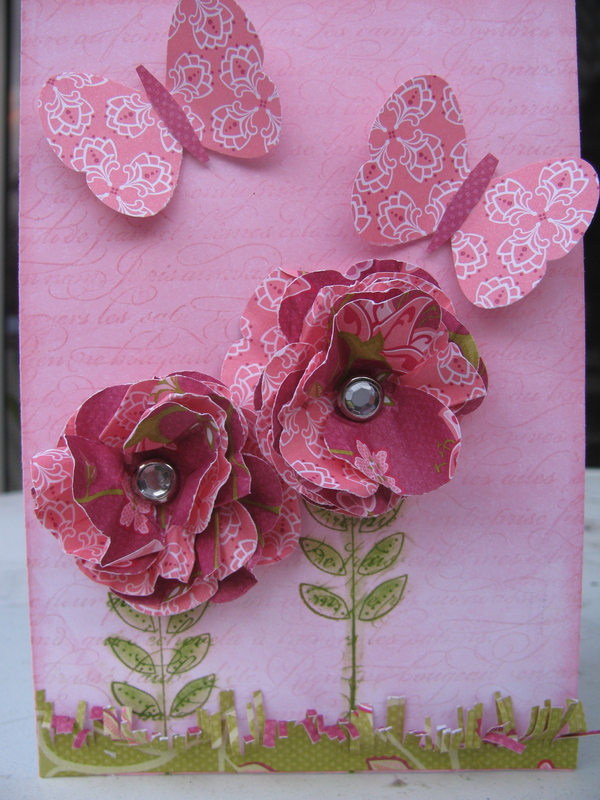 Today I have decided to make a card that is very spring-like, to help me look forward to the warmer months ahead. 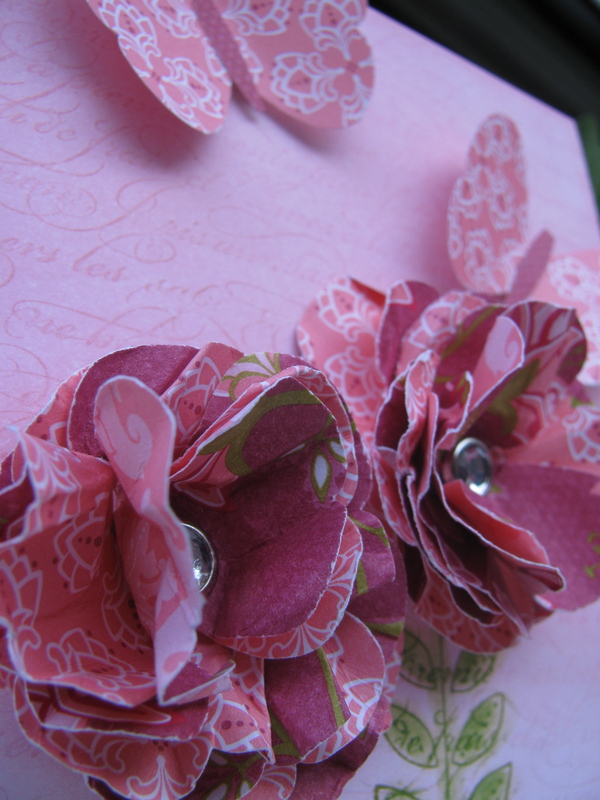 I used my butterfly punch to cut out some gorgeous Raspberry Tart paper, layering them to make each flower. I used a brayer to create the background, stamping over the top in En Francais. Did you know I typed the En Francais text into Google translate once? It’s a lovely verse about gardeny types of things! LOL! As a teacher, I place a huge amount of importance on the environment of the classroom and the crucial role that it plays in learning. 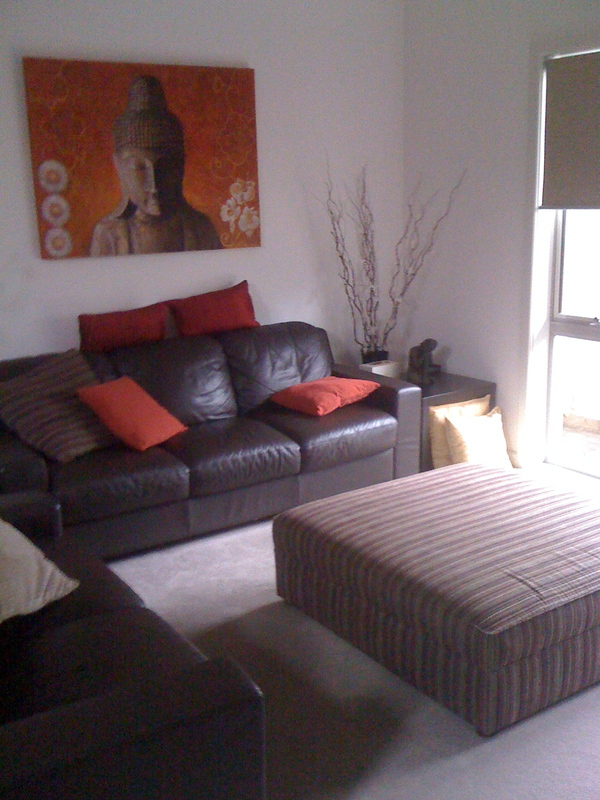 When I felt that poor old Mojo was disappearing recently, I looked at my creative space and gave it a bit of a make-over in an attempt to reignite my creative flame. I visited a new store at Parramatta a fortnight ago. The store is called Typo – it’s a grown-ups Smiggle, housing the most wonderfully quirky stationery. Now I don’t know about you, but I just LOVE stationery and I spent quite a bit of time in there nosing around. 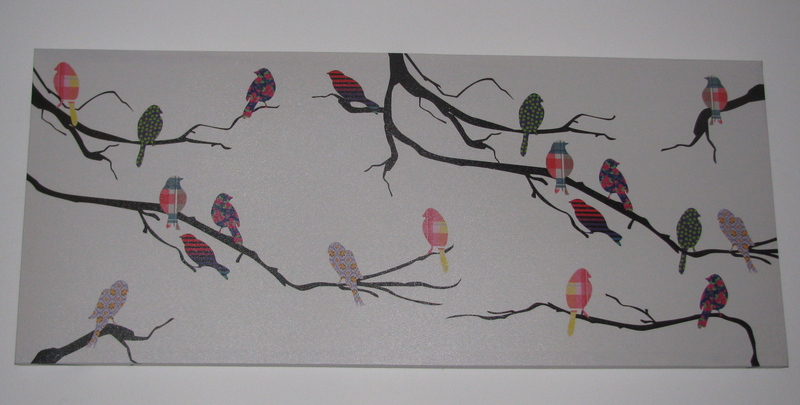 I found this print and decided right there and then that I MUST have it for my creative space! So . . . . I bought it. Simple. There was a matching set of gorgeous little lanterns which I also fell in love with, but I walked away with the print, thinking that I would sleep on that purchase. 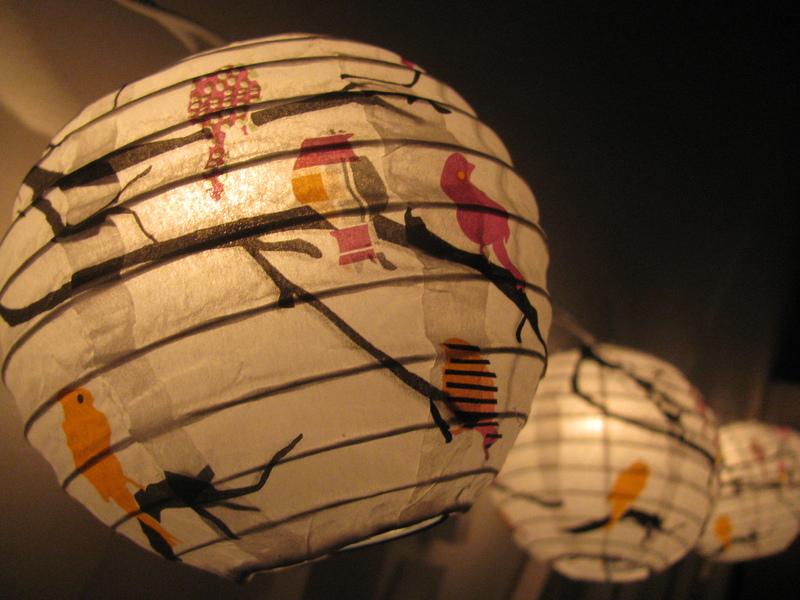 Well, the very next day, yes, next day, I went into the World Square Typo store and bought the lanterns. You only live once, may as well be indulgent and have fun while you are doing it. I was with my lovely friend Allyson and she encouraged me and I simply had to agree! 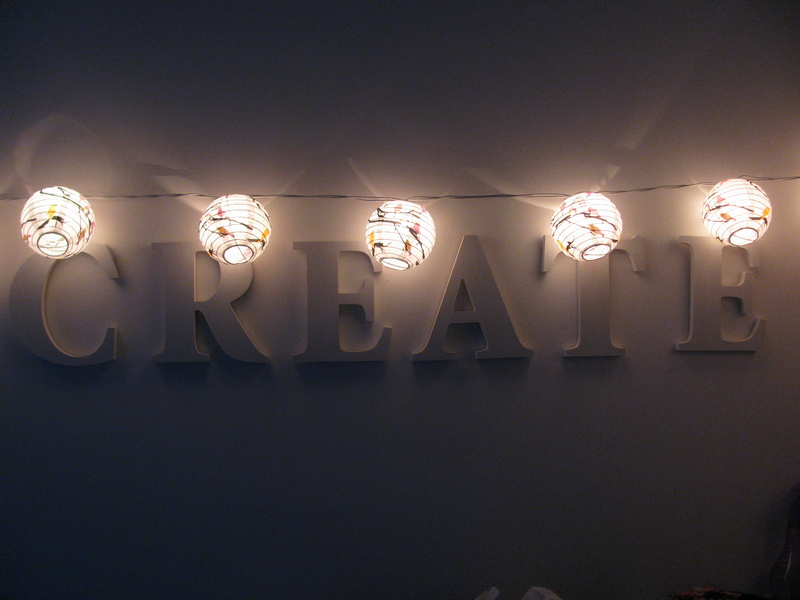 Today I put together the little lanterns and gave them a home in my creative space too! Hope you love them as much as I do! I’d love to hear what you think – leave me a comment and let me know! 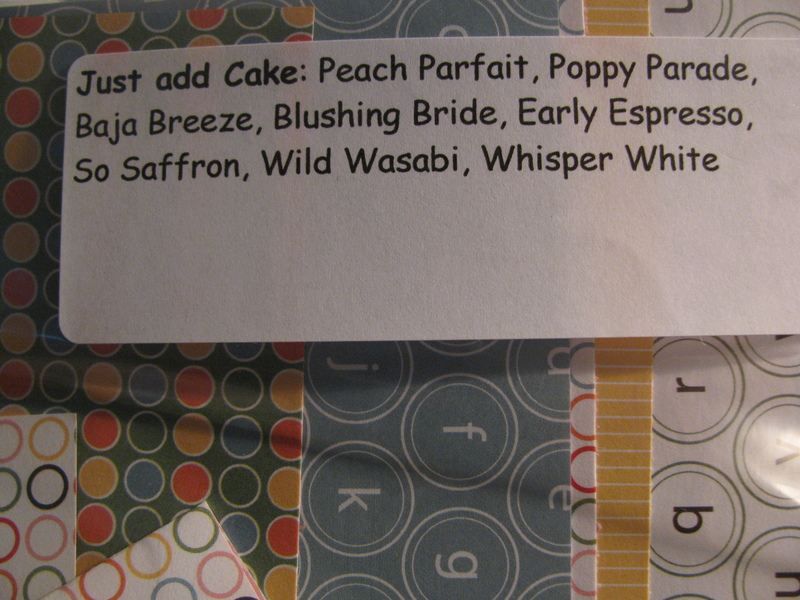 So what does this have to do with Stampin’ Up! WELL!Mojo has returned in a BIG way and I have some beautiful projects to share with you over the coming weeks – so stay tuned! My mojo has returned! Not sure where it went or who was holding it captive – but it’s back! YAY! In celebration of the return, I have decided to share a few projects with you that I have been working on over the last few days! 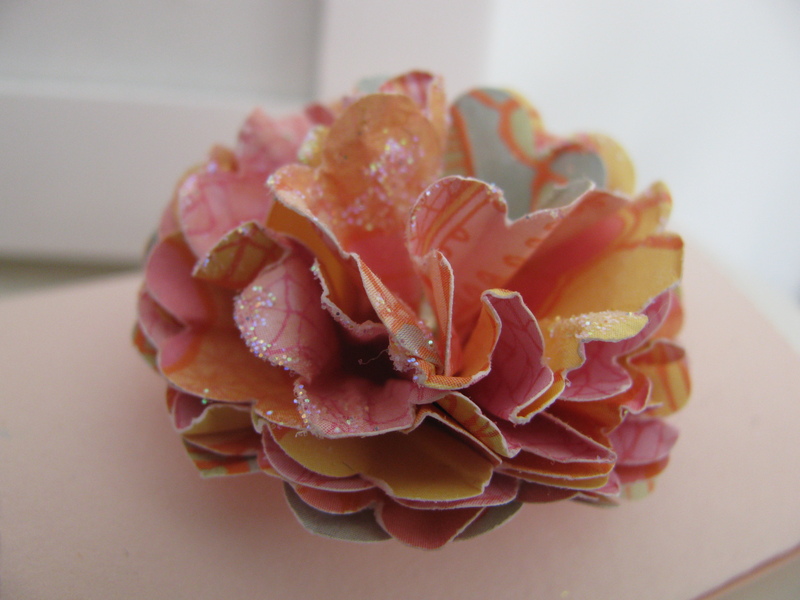 These come from my last class “Make your own embellishments” and they’re quite ‘flowery’! I have even included one that my eight year old daughter made for me – very cute! Close up of the fabulous Build-a-Brad! Build a brad with a 'kissed' Medallion! WOW! I’m a bit excited – perhaps it came back because I’m on holidays?? By the way – have you become a fan on Facebook yet? We are nearly at the 100th fan mark. If you become a fan and refer a friend who just happens to be No. 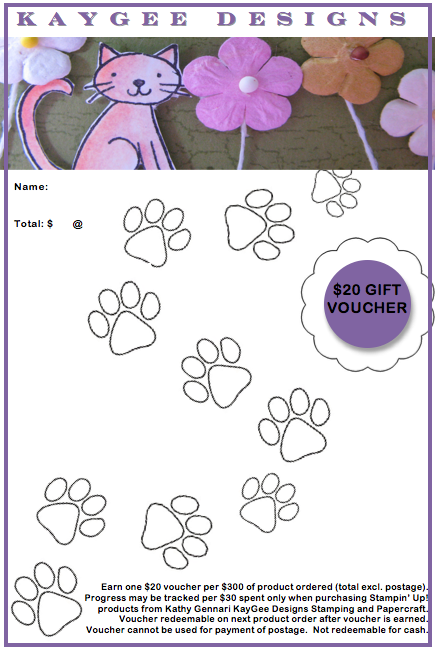 100, you will be receiving a little pressie from me . . . . YAY! Find me here on Facebook and ‘Like’ today!